The Manchester United goalkeeper seems set to undergo eye surgery in the summer, just after the end of the English Premiership campaign and just before Spain’s Olympic football participation begins. 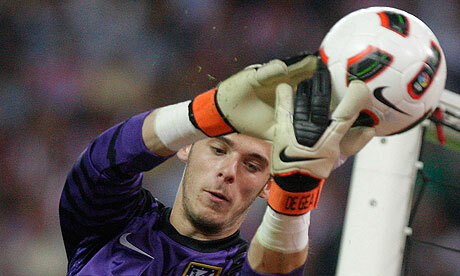 The goalkeeper is unlikely to be called up by Spain for the 2012 UEFA European Championships. Iker Cassilas is the undisputed number one for his country, him being a World Cup and European Championship winner and captain and what not, and Pepe Reina serves as a capable number two. After these two Victor Valdes offers another alternative. Simply put, as things stand there is no room for David De Gea in the international first team set up for Spain. The goalkeeper was signed from Atletico Madrid in the summer, for a fee close to £19 million. The youngster was expected to take the place of the now retired Edwin van der Sar but as of now he has failed to solidify his status as number one at club level and in recent weeks has even found himself relegated to the bench as Anders Lindergaard, the Danish goalkeeper, has been promoted to the number one position. De Gea’s descent, and Lindergaard’s ascension, are a consequence of the Spaniard’s stuttering displays so far this season. He has excelled in certain matches and then struggled with some of the more elementary parts of a goalkeeper’s game in others. His repertoire is not really in doubt, it is clear he can collect the bacll from crosses, punch when necessary, shows capable judgement, wonderful agility and stupendously good reactions. The problem is that these talents rarely feature in the same match and just when one aspect of his game is shining then another goes missing. Such teething problems ought to be expected of a young goalkeeper, especially when one is trying to cement a position at one of the biggest clubs in the world, but considering the transfer fee that was spent to acquire the Spaniard’s services most Manchester United fans, and presumably the Manchester United managerial staff too, assumed he would settle in in a far more convincing manner. His long term position is not really under threat and it is assumed that once the opration is completed, necessary because the player currently wears contact lenses and often struggles to see properly, allegedly, under spotlights, the player should be able to return to his mantle as Manchester United’s number one. The surgery is likely to be a form of laser surgery, to correct the goalkeeper’s long sightedness.